Originally, chintz was a brilliantly colored cotton calico from India. In the early 2000s, chintz, or glazed chintz, describes a firm, medium to heavyweight, balanced plain weave, spun-yarn fabric converted from print cloth or sheeting and finished with friction calendering. Chintz is usually all cotton or a cotton/polyester blend. Single carded and combed yarns are used in sizes ranging from 28 to 42 and counts ranging from 64 to 80 warp (lengthwise) yarns per inch and 60 to 80 filling (crosswise) yarns per inch. Chintz has a smooth, shiny glazed face and a dull back. Fully glazed chintz is finished with a compound that stiffens the fabric. A padding machine applies the finishing solution, then the fabric is partially dried, and friction calendered. One roll of the friction calender rotates faster than the other and polishes or glazes the fabric surface. If the solution is starch or wax, the effect is temporary. If the solution is resin based, the effect is permanent. Semi-glazed or half-glazed chintz has no stiffening agent and is friction calendered only. Similar fabrics are cretonne (not glazed) and polished cotton (glazed). Chintz is usually printed in large, bright, colorful floral patterns. Sometimes it is dyed a solid color or printed with geometric patterns such as dots and stripes. It is made with fine, medium-twist warp yarns and slightly larger, lower-twist filling yarns. Chintz is used in draperies, curtains, slipcovers, and lightweight upholstery fabrics. Upholstery chintz usually has a soil- and stain- resistant finish. 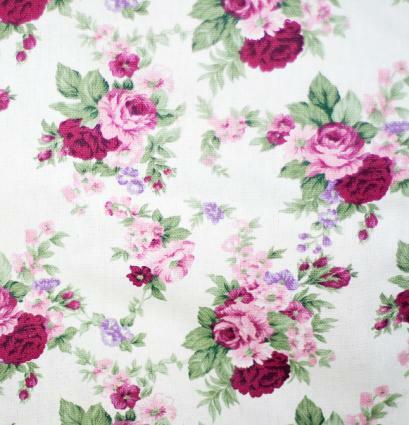 Chintz is sometimes used in women's dresses, skirts, and blouses, and children's wear. Permanently finished chintz can be machine washed and dried. Otherwise, dry cleaning is necessary to preserve the surface glaze. Chintz is a smooth, crisp fabric that drapes into stiff folds. The glaze may grow dull with use. The word "chintz" is from the Hindustani chhint or chint, derived from the Sanskrit chitra for spotted or bright. Chints was the original plural spelling of chint. In the seventeenth century, plain weave cotton fabrics that had been hand-painted or block printed in India with brilliantly colored patterns of plants and animals were imported into Europe and America. The establishment of import/export companies in India by various European countries enhanced the trade of chintz as did the policy of sending sample patterns to India for craftsmen to copy. These novel fabrics were used for gowns, dresses, lounging jackets, robes, bed hangings and coverings, and household textiles. These fabrics quickly became popular because of their novel prints, texture, soft drape, and easy care. Because of their popularity, French craftsmen began to try to duplicate the patterns. This created competition problems for silk and wool goods produced by local weavers. Because of the potential loss of revenue and jobs, in 1686 the French government restricted production and importation of these fine quality, multicolored printed cotton fabrics (Indiennes) from India. England also restricted imports, even though India was an English possession. In spite of various bans and prohibitions, the French, Dutch, Portuguese, and English imported chintz became the basis of European dress and furnishing designs throughout the rest of the seventeenth century and into the mid-eighteenth century. The imported fabrics combined indigo, madder, and an unknown yellow dye with a variety of mordants to achieve an amazing range of colors including blue, green, black, lilac, and crimson. The process of achieving this range of color with only a few natural dyes was not well understood in Europe at that time. The development of domestic printing facilities and the research needed to identify mordant and natural dye combinations and thickening agents for print pastes produced the European textile industry. Research by English, German, and French dyers led to advances in dye chemistry and ultimately the development of synthetic dyes. By the 1740s, demand for white goods from India increased as European printing houses were established. By the early 1750s, a drop in the quality of Indian printed goods had occurred, probably due to pressure for increased production and lower costs. By 1753, the Indian chintz export trade to Europe had virtually ceased. Efforts to minimize the costs and time needed to produce the fabric and the demand for more printed fabric with better performance led to the development of new mechanized printing methods. The influence of Indian chintz has not disappeared. Some contemporary floral elements related to early Indian chintz patterns include the use of sprigs and bouquets, trailing floral patterns, and large realistic, brightly colored flowers. Crosswise yarn in a woven fabric. Passing woven fabric between heated rollers that oscillate. After this treatment fabric has an increased shine, which will be permanent only if either the fibers or a finishing material applied to the fabric and thermoplastic. Crosswise yarns in a woven fabric. The cloth was flattened and burnished with buffalo milk and myrobolan (a dried fruit containing tannin) to give it a smooth surface. The protein in the milk probably provided bonding sites for the dyes. The pattern was drawn on paper. Holes were pierced through the paper along design lines. Powered charcoal was rubbed on the paper to transfer the pattern to the fabric. The design outlines were painted in. Then, the entire fabric surface was coated with wax except for those areas designed to be blue or green in the finished fabric. The fabric was immersed in an indigo vat, a requirement for fast blues and greens. After immersion in indigo, the dye was oxidized in the air and the fabric was dried. The fabric was scraped and washed to remove the wax. Most of the rest of the design was achieved by painting on a combination of mordants with thickening agents followed by dipping the fabric in a madder bath. Colors achieved in this manner include orange, brown, pink, crimson, lilac, purple, and black. Washing the fabric removed most of the madder in the non-mordanted areas. The fabric was aged in the sun to remove any residual color in the nonmordanted areas and to set the color in the mordanted areas. Finally, any areas requiring yellow (including any area dyed blue that was designed to be green in the finished fabric) were painted with saffron or another yellow dye. Unfortunately, since the yellow dye had poor light fastness, most historic chintz prints have lost that component of the design. See also Calico; Cotton; Dyeing. Creekmore, Anna M., and Ila M. Pokornowski, eds. Textile History Readings. Washington, D.C.: University Press of America, 1982. Storey, Joyce. The Thames and Hudson Manual of Textile Printing. London: Thames and Hudson, Inc., 1992.